The predecessors to museums were treasuries, where such special or exotic objects of monarchs could be found which were collected by them or given to them presents during journeys. The treasures were presented for the privileged guests. The curiosity for rarities and the desire to look inside the full stores have not decreased for centuries, although museums have become available cultural institutions for everyone nowadays. In the practice of late-20th century museology exhibition and museum store sharply separate. As a result, only 5% of the objects protected in the museums of the world are displayed for the audience. In the Study Collection was established to change this rate. The Study Collection makes it possible to admire the multitude of objects and to view the object types and series at the same time. This access is realised in ideal climatic and light conditions, which are also favourable for protecting the objects. The furniture, (tables, chests, cupboards, beds, chairs, benches) potteries, household equipment, (glassware objects too), baskets, cast-iron stoves and ranges are organised on the basis of material and type. 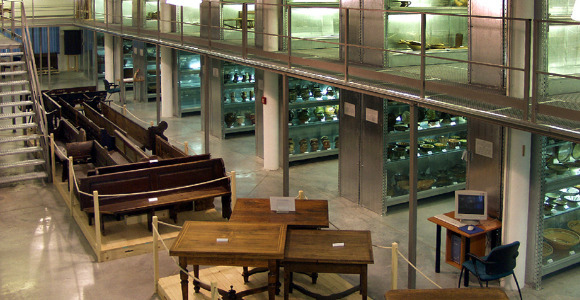 The 2000 square metre, two-storey shop in the office building is also a place where museological wors – are displayed (several thousands of objects). Choose a nice or interesting object! Type its identification number – which can be found next to the object – into the search box of the Study Collection on the computer in the exhibition space. You can get to know where and when the object was made, from which material with what technique. On the enlarged picture you can have a closer look at the date or the decoration. If you are interested in what kinds of objects can be found in the museum collection from your birthplace, you can find out soon! You may try it even at home! Explore the fun spots for kids in the open air museum with the whole family!